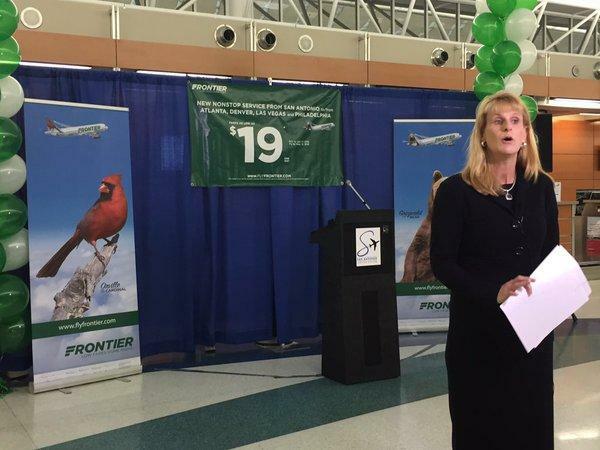 Debbie Price of Frontier Airlines announces the company will begin service in San Antonio in 2016. Frontier Airlines will begin service in San Antonio this year. The announcement was made Tuesday. Hear Virginia Alvino's story about Frontier Airlines bringing more direct flights to San Antonio Airport. Frontier will provide direct flights from San Antonio to Philadelphia, a route not currently offered. It will also add more direct flights to Atlanta, Las Vegas, and Denver, where the company is based. Last year City Council approved a program to provide financial incentives for airlines to begin serving San Antonio. City Councilman Joe Krier says this announcement shows the program is working, and is an important development for tourists and businesses alike. Frontier advertises itself as an ultra low cost airline, with flights starting at $19 one way during their introductory promotion, and a la carte services like seat selection available at an added cost. Frontier will begin service from San Antonio this May. Can New Incentives Bring More Non-Stop Flights To San Antonio? San Antonio aviation officials have unveiled a package of financial incentives aimed at luring more non-stop flights to the city-run airport. The effort follows stinging criticism that airport pricing and flight availability may not be competitive enough to attract top businesses to the area. Growing Pains: Can San Antonio's Airport Compete? The U.S. Census Bureau recently named San Antonio as one of the 10 fastest growing, big cities in the country. Area planners estimate one million more people will move to Bexar County in the next 25 years. We begin by looking at whether San Antonio International Airport is competitive enough to help attract the cutting-edge businesses area leaders would like to attract. San Antonio’s airport director told city council members Wednesday that a net 300,000 passengers who used to fly out of the San Antonio International Airport are now driving to Austin for flights. It’s another bit of data that adds fuel to concerns that San Antonio’s airport may have lost its competitive edge to Austin. As part of our project, Growing Pains, Texas Public Radio continues our report on the San Antonio Airport, with the results of what an analyst found when we asked him to compare its ticket prices with that of other cities.